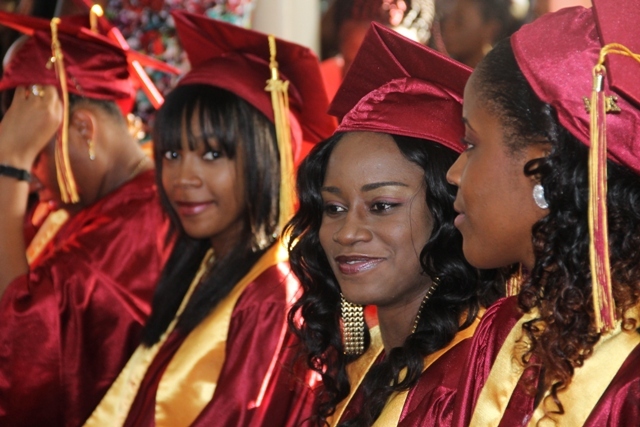 CHARLESTOWN NEVIS (November 14, 2014) — Valedictorian of the Nevis Sixth Form College’s (NSFC) graduating class of 2014 Chloe Williams, called on her fellow 39 graduands to appreciate and respect authority; work hard, play harder and remember their past. She said she was sharing the three important lessons she had learnt that they too could benefit from. “Our parents also deserve respect always! Not because we have surpassed that mystical age of 18, it doesn’t mean that we can treat our parents however we like! Not because some of us are employed and our palms are being tickled by a little ‘cha ching’, it does not give us the right to disrespect our parents, regardless of how old we are! “There will be times when we make decisions that disappoint them or do not fit into their master plan for our lives but we must respect their opinion and politely agree to disagree,” she said. 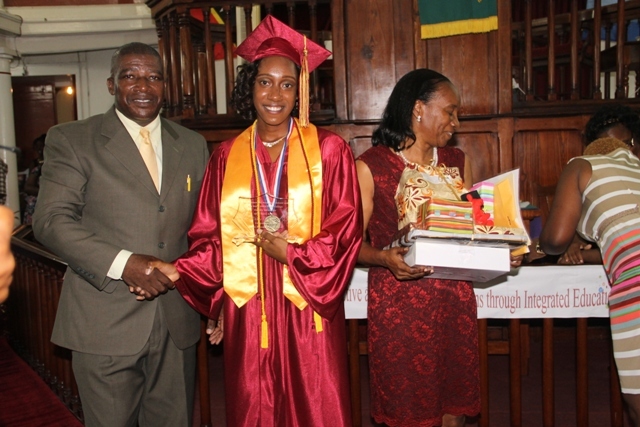 With regard to working hard and playing harder, Williams told her fellow graduands, with some humour, that their brain would thank them if they followed that rule. “It is my hope that as we continue to mature and face new challenges in life, that we would take with us this lesson and always remember to allow for downtime. So if you happen to be in town during your lunch hour, and you see a few of us smartly arranged in a circle and you hear “Cinderella dressed in yella went upstairs to kiss a fella?” don’t be alarmed. Just be happy that we still remember how to play,” she said. For the third lesson, Williams noted the importance of reminiscing, as they moved along in life. “I challenge you, the next time you feel like you can’t remember anything exciting about Sixth Form, go on YouTube and look for our edition of the Harlem Shake video. When you’ve finished laughing and drying your tears, you can come and thank me,” she said. In her final words of advice, Williams encouraged them to love their neighbours as they would themselves and quoted Galatians 5:14 to strengthen her point. 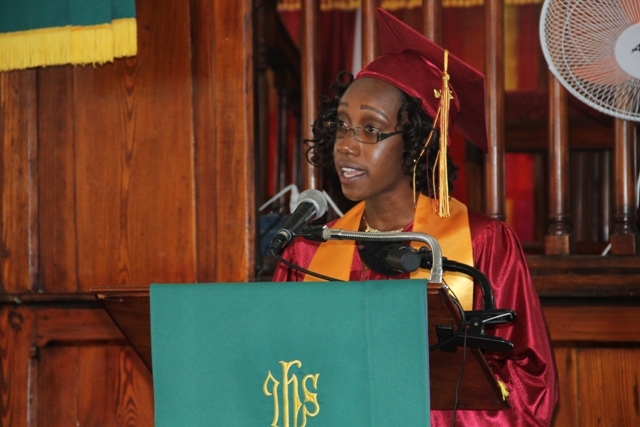 Williams also used the opportunity to thank the teachers and parents on behalf of the graduating class. “Kindly allow me, on behalf of the entire graduating class of 2014, to thank all teachers and parents for their investment in us. They are our primary stakeholders and I implore you to begin thinking of ways you can give them returns on their investment because at the end of the day, shareholders are looking for their dividends and they want them big!” she said.